Woo, it's New Year's Eve! Are you out partying tonight, or are you staying in like I always do? I thought a shazam polish was in order, so I decided to add a few coats of Backstage Pass to another Color Club polish. Boy, is this purple and silver hexagonal glitter topcoat striking on the nail! It's a bit gaudy, but I sort of love it. It definitely seems appropriate for a New Year's Eve party. The application of it was a bit annoying, however. I had to use many small strokes to place the glitter on there without immediately pulling them off. Also, you will need to use a few layers of topcoat if you don't like the uneven surface. I hope you have a fun and safe New Years! I just got back from Texas! I honestly thought I'd get to blog more often, but I was on the go every day! I had a great holiday and I'll get to see my family next weekend. Despite Christmas being over, there's no reason to stop the holiday polishes. I've been waiting for Dr.'s Remedy to come out with glitter polishes, and they obliged this season. They call is Resolution Red Glitter, but it looks a bit more pink when you put that much silver glitter in there. I was worried it was going to be sheer, but they did a wonderful job adding enough small glitter that I only needed 2 coats. I'm really glad they're starting to branch out into different finishes. You can find their polishes on their online store and they'll set you back $17. I hope you all had a fun and safe holiday season! I know, I was gone a few more days than I would have liked, but I'm sure we both have been pretty busy. Texas is pretty chilly so far, but it's supposed to warm up to almost 70 here by the time we leave. Yesterday we did a bit of shopping and I had my first experience at a Bed Bath & Beyond that has a Harmon's inside of it! It was so glorious! Oh why can't we have one like that? Unfortunately they were out of the Revlon polish I was looking for, so you Texas ladies sure have good taste! I made this little compilation of polishes last week and I really enjoyed it. The small golden glitter with the larger holographic flakes really pops over the Revive Ruby Red color. The flakes aren't extremely noticeable unless you look closely, but it adds a little something special to the glitter topcoat. The application of the red was perfect, but these Color Club glitters take a bit more work. Instead of using long strokes, I have to use lots of little ones to deposit the glitter without brushing them all off. Tomorrow I fly to south Texas! Unlike the past several holidays, I will have internet service so I will be continuing to post the coming week. I found the new Sally Hansen Gems Crush polishes at Walgreens where they were found with the core collection, not in a limited edition display. Does this mean that they are permanent? As of right now, I'm not too sure, but I hope to find out. They were pretty expensive, at $6.99 each, but you can often find Sally Hansen products buy 1 get 1 half off. Cha-Ching is amazing, just amazing! It contains fine red glitter particles with larger silver pieces. It was slightly sheer, with a few bald spots after two coats, but it was perfect after the third. The only downside to the polish is the annoying wide brush with a tapered end that Sally Hansen sometimes uses. It won't stop me from loving this polish, but I really don't like them. Do you see how cute these bottles are? They look just like little light bulbs! I wish companies would have other seasonal bottles, but I can understand how difficult that would be. I haven't reviewed any Jessica Cosmetics polishes lately, and I'm happy to show you the Shine on Collection. Lucky Star is a holiday inspired light champagne foil, that, while not really unique, is still a nice gold color. The best part of this polish (besides the cute bottle) is the application. It had probably the best application of any polish I own. I know, that's really saying something! It was just the right thickness with a bit of a whipped consistency (do you know what I mean?). OoOoOo! I stopped at Walgreens on my way home from work and found the new Sally Hansen Gem Crush polishes and boy are they gorgeous! They didn't have a separate display for these...they were just found with the other main collections from Sally Hansen. I ended up getting two of them and I hope to show them soon. What is my deal? It's only 5 days to Christmas and I haven't posted many holiday colors. It's definitely time to change that! Essential Emerald is a color from the Dr.'s Remedy Jolly and Joy collection and is quite the unusual color for a holiday collection. It looks more like something you'd find for St. Patrick's Day than Christmas. I also really like the slight shimmer you can see in there. It's faint, but definitely there. The application was slightly thinner than other Dr.'s Remedy polishes, but I still just needed 2 coats for full coverage. These will set you back $17 and you can find Dr.'s Remedy on Twitter and Facebook for more information. Only 1 more week until Christmas! Are you done with your shopping? I'm happy to say that my husband and I finished everyone up this weekend. Revlon's Carbonite came out months ago, but I only bought it a few weeks ago at Ulta. It's supposed to be a dupe of Chanel's color called Graphite. I've never bought a Chanel polish *sigh* so I cannot compare them for you, but if you do a little Googling, you can easily find some photos. Carbonite is a dark grey polish with lots of silver and gold shimmer. Apparently one main difference between Carbonite and Graphite is that Carbonite is missing some larger gold flecks found in Graphite. I'm usually pretty happy with Revlon's application, and this extends to Carbonite as well. I'm not 100% sure if this polish is still around, so please let me know if you've seen it recently. Congrats to TrailerHood Chic for winning the Sally Hansen Nail Prism from my giveaway! Thank you guys so much for participating and I hope to start doing these more often in the new year. If you haven't already, make sure to check out your local Ross store (do you have one?) because I found both Back to BoHo and Backstage Pass collections for $7.99 each. Score! I didn't have any from the Back to BoHo and only one (which I will be showing shortly) from the Backstage Pass one. The only thing wrong with the polishes is that their labels aren't on there, but it's an easy fix and they polishes are well worth it. Ulta has definitely hit it out of the park with their newest colors because I've been loving them all, especially Army of 1. It's a wonderful dusty army green that has a sprinkling of shimmer if you look closely (you may have to click on the picture to really see it). The application was just fine and only needed 2 coats. I feel like most of the polishes I've used lately only needed 2 coats. Either the companies heard me complain about sheer polishes, or I've just been lucky. I hope you are enjoying your weekend! I've been in a pretty good mood lately, mostly because I'm doing some new experiments at my job. There's nothing like something new to pique your interest. I'm shocked that I only have about a week before I leave for Texas. December has been flying by. 2011 was a bit rough for me in the beginning, but things have definitely improved as the year went by. Ulta is killing me with these terrible names. Have they hired the name makers from OPI or something? Despite the cheesy name, I love this periwinkle blue creme polish. Is it purple, is it blue? It's both! In my opinion, this is a pretty unique color, at least in my modest collection ;-) Ulta polishes now retail for $6, but you can often find them on sale, or get their online coupons. I think this one is definitely worth the $6! Have you read The Hunger Games? I did, and I enjoyed them quite a bit. The first one was definitely my favorite, with Mockingjay being my least favorite. Due to its popularity, China Glaze is releasing a collection based on colors that would be popular in the Capitol. I'm not 100% sure when these will be released, but my guess it will correspond to the release of the movie, which is March 23, 2012. It looks like the collection is full of glitters and shimmers which is right up my alley! Just to be clear, I am team Peeta all the way. What about you, are you team Peeta or Gale? If you ask Pantone, 2012 will be the color of Tangerine Tango. Their Wiki page shows all the "Color of the Year" winners from 2000. If this color appeals to you, Butter London has the perfect color for you called Jaffa. The dictionary says that a jaffa is type of seedless orange...and also British slang for an infertile man. 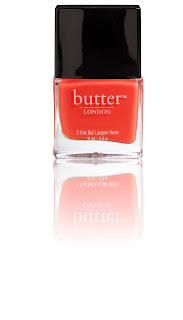 Whoa, Butter London. What a weird name for a polish! Sometimes your names go a bit too far. Happy Tuesday! Don't forget about the giveaway I'm having, so please see the right side bar for more information. There aren't too many entries so your chances of winning are still pretty high! I feel like I've been in a blog rut since I've been back from Cambodia. I used to have fun little stories and nail polish information, but I've got nothing. Maybe what I need is a nail polish haul to lift my spirits (too bad it's Christmastime and I've got no extra cash). No worries, I'm sure things will be back to normal soon. Maybe I need to find that special polish that's calling my name to get me back on track...do you have any suggestions? Speaking of that special polish, I am loving that fall feeling of Balance Brick. I've always said that I don't have seasonal polishes and I'll wear whatever color I want, whenever I want. This being said, Balance Brick is just perfect for fall and winter. The application and formula was superb and the only downfall I can see is the price. If you've got the money, it's worth it! I am such a sucker for Quaker Oatmeal Squares cereal. I eat them at least once a day, and will have it as a snack later in the evening if I have the chance. Of course I started eating them before dinner tonight, and then I ended up eating dinner. I am sooo full. Why, oh why do I do this to myself? Defense Deep Red is the second polish from the Fall Forever Collection and it's a dark red/brown jelly polish. If you're into vampy jelly polishes, then this one is for you. Unfortunately, jellies are not my favorites, but I can see others liking it. It was slightly sheerer than other Dr.'s Remedy polishes, but it was mostly opaque with 2 coats. Again, you can find them on their website, Twitter, or Facebook and they will run you around $17. Thank goodness it's the weekend! We finally set up our Christmas tree and lights so I'm finally starting to feel the holiday spirit. Have you set yours up yet? Maybe I'll post a picture of it, despite missing some sort of garland. We stopped at Target to look for some, but they only had some lame ones. Where can I get some cool garland? I've posted about Dr.'s Remedy polishes previously and I have their fall collection to show you guys. What makes these polishes special is that they were developed by doctors and are approved by the American Podiatric Medical Association. Perhaps their polishes are a little more expensive than others based on the fact that they all contain tea-tree oil, garlic bulb extract, wheat protein and vitamins C and E. Noble Navy is a really great navy blue creme that never looks black in darker light. Perhaps the best part of these polishes is the application. I have never had to apply more than 2 coats of polish and they have the perfect formula. The only downside of these is the price, which will set you back $17 and can be found on their website. You can also find them on Twitter and Facebook. Are you liking the new bottles for the Ulta polishes? They just came out recently, and unfortunately, they raised the prices from $5 to $6. No worries, they are always on sale. While the name is absolutely horrendous, I quite enjoy Into Astrono-Me? since it is pretty unique. It is a dusty blue color with lots of teal/sapphire blue shimmer. There were still some bald spots after the first coat that went away after the application of the second coat. Don't forget to sign up for my December giveaway where you can win your own holographic polish! Sally Hansen Nail Prisms: Ruby Diamond-I'm Giving It Away! While I was away, I sent my husband a message about Ross having some hard to find Sally Hansen Nail Prisms so he went out and waited in line for 30 minutes to get it for me. I was delighted to find that it included an awesome bright pink linear holo polish called Ruby Diamond. Despite not being ruby-colored at all, it was full of bling and holo goodness. You know what else I haven't done in a really long time? Had a giveaway! Yup, I thought this would make a really special giveaway since these are so hard to come by. In order to enter, please leave a comment to this post with your e-mail address. You must be a follower in order to win. And finally, this is only open to US readers (I am so sorry to my international readers). Please only 1 entry per person. A winner will be chosen by random on Friday, December 16, 2011. Good luck! I'm happy to say that I got some Christmas shopping done tonight and the stores were quite slow. That only leaves like 10 people left to buy gifts for. Blarg. This year instead of going to D.C. we're going to Texas to see my mother and sister-in-law. The thought of a warm(er) Christmas is a happy thought, even though the weather in North Carolina hasn't been too bad so far this season. What are your plans? Are you sticking around your house, or do you have to trek along to another state? Speaking of the holiday season, Candy Cane is the final Beyond the Mistletoe polish I have to show. I find the name a bit of a misnomer in that it is not red, but a light pink holographic glitter polish. It doesn't scream winter to me at all, but sometimes it's nice to have colors other than the usual red, green, silver and gold. I'm also happy to report that it is quite opaque and, like the rest of the collection, can be worn alone or over another color. I know, I've been a bit behind on my posting. My family came to NC to have Thanksgiving since we couldn't have it last week. I must say, my mom made quite the spread and I really overate. What are you doing this weekend? When I first saw Sugarplum Fairy, I thought it was just a silver holographic glitter polish in a clear base, but if you look closely, you can see that it is mostly a lilac glitter. It's subtle, but it's there. Even with 3 coats, there are a couple bare spots, but it's minimal. I liked it ok, but I think Holiday Splendor was better with the inclusion of a base color instead of it being clear.